Taman Safari Indonesia juga membuka tempat wisata di daerah lain yaitu Taman Safari Indonesia 2 terletak di lereng Gunung Arjuno, Kecamatan Prigen, Kabupaten Pasuruan, Jawa Timur, serta Bali Safari & Marine Park di Desa Serongga, Kecamatan Gianyar, Kabupaten Gianyar, Bali dan Batang Dolphins Center di Pantai Sigandu, Kabupaten Batang, Jawa Tengah. 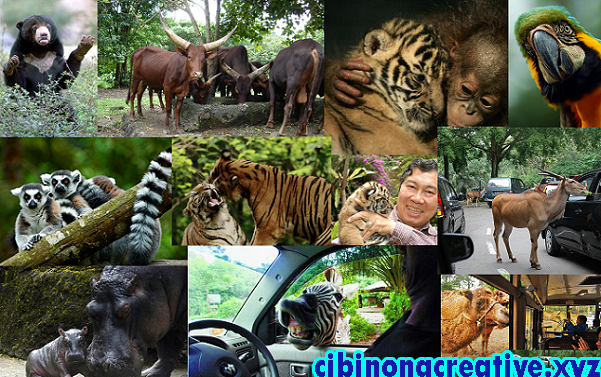 Taman Safari Indonesia is a family tourist attractions environmentally oriented animal habitat in the wild. Taman Safari Indonesia is located in the village of Cibeureum District Cisarua, Bogor, West Java, or better known as the Peak area. These parks serve as a buffer Gunung Gede Pangrango National Park at an altitude of 900-1800 m above sea level, and has an average temperature of 16-24 degrees Celsius. The uniqueness of this resort from other zoos in Indonesia are the visitors can walk around to different places to get a close look at all kinds of animals by means of a private car or take a bus that already provided by the manager of the Safari Park. Visitors can also interact directly with feeding the animals. Taman Safari Indonesia was built in 1980 on a tea plantation that are no longer productive area of ​​50 hectares. The park is designated as a National Tourism Object by Susilo Soedarman, Minister of Tourism, Post and Telecommunications at that time and inaugurated a Rare Animal Breeding Center in Indonesia by Hasyrul Harahap, Forestry Minister at that time, on March 16, 1990. Now, the vast Taman Safari has grown to 168 hectares and is equipped with a variety of educational and recreational facilities as well as holding a night safari during weekends and long holidays. Taman Safari Indonesia also opened tourist attractions in other areas of Taman Safari Indonesia 2 is located on the slopes of Mount Arjuno, Prigen, Pasuruan, East Java, and Bali Safari & Marine Park in the Village Serongga, District of Gianyar, Gianyar, Bali and Batang Dolphins Center in Sigandu Beach, Batang regency, Central Java. Taman Safari has about 2500 collection of animals from nearly all over the world including rare animals such as Bengal tigers, giraffes, lions, orangutans, elephants, dwarf buffalo, dragons and so forth. Taman Safari Indonesia is equipped with various recreational facilities and attractions such as bus safari, artificial lakes, water bikes, canoes, swimming pool with slides of the waves, the little train that crosses the township ala Africa, bird park, baby zoo, Ferris wheel, elephant riding, comedy swivel, circus performances, gocart area, car bombs, house demon, animal attractions, traditional arts and magic in the open stage.